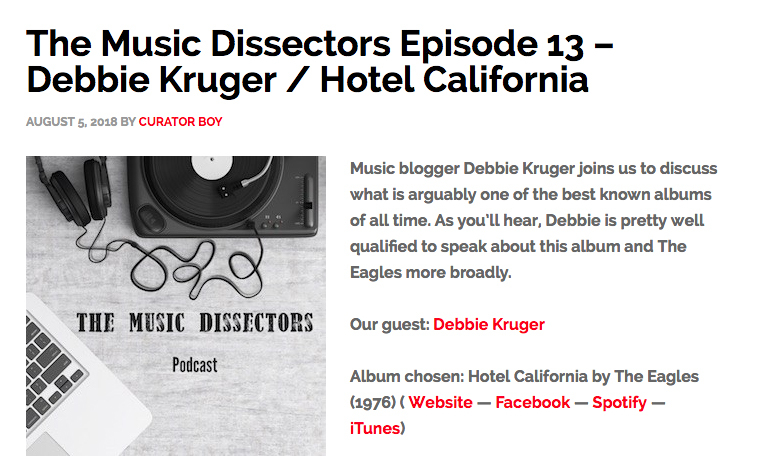 If you’ve been reading my words on music for some time and have an interest in hearing my voice, here’s an impassioned Debbie being the latest guest on The Music Dissectors, an Australian-produced podcast that devotes each episode to an album that has made an impact on the life of the guest. There are many albums that have had that impact on me but I could not go past Hotel California as the number one. So this is 90 minutes of me talking about that, with various tangents as well. Of course I should have known what “colitas” is but I didn’t sit down and study lyrics and go back over all the information I’ve learned in more than 40 years of being an Eagles devotee. I wanted to speak to the personal experience, the passion, of loving the music. August 7, 2018 in Reflections.